Last week, WAKO president paid a short visit to Cameron on occasion of 2009 African Championships which were held in Douala (Cameron) and organized by the Cameron Kickboxing Federation leaded by Mr. Emmanuel Essissima. A few the defections, like those of South Africa, Algeria, Egypt, Sierra Leone and Kenya. However, 7 were the participating countries (Cameron, Isle Maurice, Senegal, Gabon, Nigeria, Tunisia and Morocco) and 70 the competitors, some of them quite good. 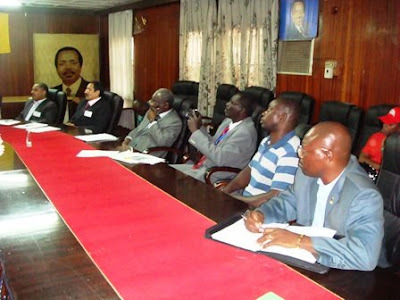 During the Championship, all African countries delegates went to Yaunde, the political capital of Cameron, where in the Ministry of Sports meeting room they had their extraordinary General Assembly. WAKO Africa, since the 2007 African Games held in Algeria, suffered a sort of vacancy of its president Mafoud Louali. Everybody felt the necessity for a changing, also because any organization cannot grow without a good leadership. Unanimously, Emmanuel Essissima was elected new president, while Tunisia (Boubakar Farhati) and Morocco (El Hilali Driss) were respectively elected 1st and 2nd vice-president of WAKO Africa. Mr. Mansour Diop from Senegal is the new treasurer. It has also been decided that in 2010 (February) they will have the thirdt African Championships in Nigeria and that from that event on, their African Championships will be every two years like in any other WAKO continent. Reason is that we have to avoid having Continental Championships in the same year of WAKO World Championships.